This is User:Wild mine's talk page archive. New topics are to be posted here. Bruno Senna driving the Hispania F110 during the 2010 Bahrain Grand Prix. The F110 started testing during the weekend as they missed pre-season testing. Article of the month - 2008 Hungarian Grand Prix, current Featured Article candidate. The 2008 Hungarian Grand Prix (formally the XXIII ING Magyar Nagydíj) was a Formula One motor race held on August 3, 2008, at Hungaroring in Mogyoród, near Budapest, Hungary. It was the 11th race of the 2008 Formula One season. Contested over 70 laps, the race was won by Heikki Kovalainen for the McLaren team, from a second position start. Timo Glock finished second in a Toyota car, with Kimi Räikkönen third in a Ferrari. It marked Kovalainen's first Formula One victory, which made him the sport's 100th driver to win a World Championship race, and Glock's first podium finish. Much of the race, however, was dominated by a duel between Lewis Hamilton and Felipe Massa, who drove for McLaren and Ferrari respectively. Hamilton started from pole position on the starting grid but was beaten at the first corner by Massa, who passed him around the outside. The two championship protagonists commenced a battle for the lead that was resolved when Hamilton suffered a puncture just over half-way through the race, giving Massa a comfortable lead. The Ferrari's engine, however, failed with three laps of the race remaining, allowing Kovalainen to take the win. Having won the 2010 Malaysian Grand Prix, Sebastian Vettel leads fellow podium finishers Mark Webber and Nico Rosberg on his victory lap. Article of the month – Ayrton Senna, current B-Class article. Ayrton Senna da Silva, (pronounced [aˈiɾtõ ˈsenɐ da ˈsiwvɐ] ( listen); São Paulo, March 21, 1960, – Bologna Italy May 1, 1994) was a Brazilian racing driver and three-time Formula One world champion. He was killed in a crash while leading the 1994 San Marino Grand Prix, and remains the most recent Grand Prix driver to die at the wheel of a Formula One car. Senna is regarded as one of the greatest drivers in the history of Formula One. In 2009, a poll of 217 current and former Formula One drivers chose Senna as their greatest Formula One driver, in a survey conducted by British magazine Autosport. He was recognised for his qualifying speed over one lap and from 1989 until 2006 held the record for most pole positions. He was among the most talented drivers in extremely rain-affected conditions, as shown by his performances in the 1984 Monaco Grand Prix, the 1985 Portuguese Grand Prix, and the 1993 European Grand Prix. He also holds the record for most victories at the prestigious Monaco Grand Prix (6) and is the third most successful driver of all time in terms of race wins. However, Senna courted controversy throughout his career, particularly during his turbulent rivalry with Alain Prost, which was marked by two championship-deciding collisions at the 1989 and 1990 Japanese Grands Prix. Mark Webber became the first driver since Kimi Räikkönen in 2005 to win two consecutive races by leading every lap in the process, when he won the Spanish and Monaco Grands Prix. 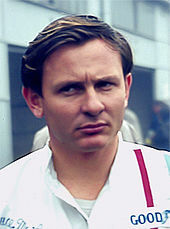 Article of the month – Bruce McLaren, current Start-Class article. Bruce Leslie McLaren (30 August 1937 – 2 June 1970), born in Auckland, New Zealand, was a race-car designer, driver, engineer and inventor. His name lives on in the McLaren team which has been one of the most successful in Formula One championship history, with McLaren cars and drivers winning a total of 20 world championships. McLaren cars totally dominated CanAm sports car racing with 56 wins, a considerable number of them with him behind the wheel, between 1967 and 1972 (and five constructors’ championships), and have won three Indianapolis 500 races, as well as 24 Hours of Le Mans and 12 Hours of Sebring. As a nine year old, McLaren contracted Perthes disease in his hip which left his left leg shorter than the right. He spent two years in traction, but later often had a slight limp. Les and Ruth McLaren, his parents, owned a service station and workshop in Remuera, Auckland. Bruce spent all of his free hours hanging around the workshop. The McLaren family homestead is located in Ngaruawahia in the Northern Waikato region and still stands today. Michael Schumacher (6th, + 5.712) was given a 20-second penalty after the race for passing Fernando Alonso under neutralised safety car conditions, under which the race finished. McLaren drivers Lewis Hamilton and Jenson Button achieved their third 1-2 finish of the season at the Canadian Grand Prix. Hamilton leads the championship standings by six points from Button. Article of the month – McLaren M2B, new Good Article. The McLaren M2B was the McLaren team's first Formula One racing car, used during the 1966 season. It was conceived in 1965 and preceded by the M2A development car. Designed by Robin Herd, the innovative but problematic Mallite material was used in its construction. The car was powered by Ford and Serenissima engines but both lacked power and suffered from reliability issues. Driven by team founder Bruce McLaren, the M2B had a short Grand Prix career, entering six races and starting only four. It scored the team's first point at the British Grand Prix and two more points at the United States Grand Prix. 1 - Webber was due to start second but was demoted five places due to a gearbox change. 1 - Hülkenberg recorded the lap time first. 2 - Nine drivers were given five-second time penalties post-race for for exceeding the safety car-in lap time. Apart from the drivers listed, Pedro de la Rosa (10th, + 42.414), Vitaly Petrov (11th, + 43.287), Vitantonio Liuzzi (13th, + 45.890) and Nico Hülkenberg (retired) were also given penalties. Hispania Racing became the first team of 2010 to alter its driver line-up, as test driver Sakon Yamamoto was promoted at the expense of Bruno Senna at the British Grand Prix, and Karun Chandhok at the German Grand Prix (pictured). Much of the race, however, was dominated by a duel between Lewis Hamilton and Felipe Massa, who drove for McLaren and Ferrari respectively. Hamilton started from pole position on the starting grid but was beaten at the first corner by Massa, who passed him around the outside. The two championship protagonists began a battle for the lead that was resolved when Hamilton sustained a punctured tyre just over half-way through the race, giving Massa a comfortable lead. The Ferrari's engine, however, failed with three laps of the race remaining, allowing Kovalainen to take the win.